1. Pour 150ml water into a saucepan and set over a low heat. Add the chocolate, whisking continuously until the chocolate has melted and the mixture combines. 2. Transfer to a bowl, then position this bowl inside a larger bowl partly filled with ice. Using a hand-held whisk, beat the chocolate mixture continuously until it has cooled and become thick and voluminous. Take care not to cool it too much as the mixture will go grainy. If this does happen, simply melt it again and repeat the process. 3. Divide the mixture between 4 small glasses or dishes. 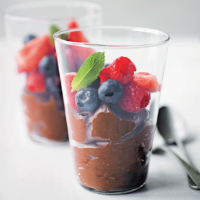 Serve with the mixed berries and mint leaves.